“B.Audio has patented a new technology around jitter management. Technology improvements are noticeable. “Very transparent, with good micro and macro dynamics. Very smooth tonal balance. The most natural timbre musical instruments. But the main thing is that he was the only one who conveyed the emotionality of the performers. Vocals – you empathize with the performer, you follow the nuances of playing the voice, melism. 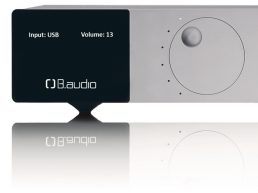 B.audio designs and manufactures High End audio amplifiers and digital to analog converters. Based on finest technological refinements, our products bring music reproduction to the next level. All B.audio units are designed and made in France. D/A conversion is the cornerstone of modern sound reproduction systems. Resulting from more than 10 years of investigations and engineering, our unique SJR technology, standing for Source Jitter Removal, provides a direct line between digital and analog. It guarantees an optimal conversion quality by fully eliminating source related jitter artifacts, form any source. Reflecting their exclusivity, our devices rely on a modern design, featuring a CNC-machined aluminium front panel with integrated ball-bearing mounted rotary knobs. Inspired by celestial gravity, the housing style stands out for the purity of its lines, letting aside any disturbing element. Best sonic qualities are nothing if they fade in time. All components are carefully selected to keep optimal characteristics over time. For instance, every chemical capacitor used in our products withstands a minimum of 5000h of operation at 105°C, which translates to more than 40 years of continuous operation in typical operating conditions. All our products come with a 3 years warranty.